Guest Blogger Alert! Thank you Cameron Williams for writing today's My Town Monday's post. There’s not much that the United States can say, “We have the oldest one.” When you consider buildings, documents, artifacts… just about everything we have is considered in its infancy by comparison. At least in California, we consider a house built in the early 1900s to be ancient. The Star of India, docked in San Diego and owned by the S.D. Maritime Museum, is the oldest active sailing ship in the world. It was built in 1863 and still sails in San Diego harbor at least once each year. We can just ignore the fact that it was actually built in the Isle of Man. After all, it has been an “American” for a vast majority of its life. 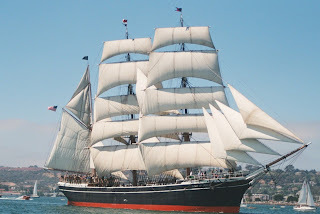 The Star of India was originally named the Euterpe after the Greek goddess of music, and circumnavigated the globe 21 times before being sold by a London firm to Americans in 1898. Now, I wouldn’t be writing about this ship unless I had some sort of personal connection. I may not have ever sailed on this ship, but I have spent the night on it… twice. For the past eight years, I have taken my fifth grade students on a field trip to the Maritime Museum, and it always includes a tour of the Star of India. We do an overnight on a different ship now, but several years ago we did the Star. Students acted as sailors in the 1870s transporting bat guano (truly). They raised the sails, swabbed the deck, prepared the food, hauled cargo with a block and tackle, searched for rats in the bilge, and even served their night watch time in the middle of the night. Click here for the S.D. Maritime Museum. Thank you, Cameron for today's post. Please come back and visit again. As in, how about every day until I hand this next book in? Cam has a great class website which has even won awards. Click here to see it. My Town Monday is the brainchild of the brilliant (I used it again, Travis!) Travis Erwin. 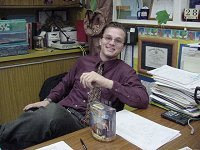 Visit Travis' blog for a list of participants. Kansas City Barbeque on Market Street is the bar from the 1986 (seriously, has it been that long?) hit movie Top Gun. It has actually been updated since this picture and has cute tables + umbrellas for eating outside. But, sorry, I couldn't find any unblurry photos. Rumor has it that a Paramount Studios' location director was tootling around San Diego, looking for some places to film Top Gun. He stopped in at the divey bar, loved it, rented it for a few days. KCBB has been living off this little bit of serendipity (I have so been wanting to use that word in a post!) for over twenty years now. I found mixed reviews about the quality of the barbeque at KCBB. But DH is an Okie, and he liked it. So, that says a little something. If you're visiting San Diego, you'll most likely hit Seaport Village. Which means you'll be close to KCBB and you may as well check it out for a meal or a drink, tickle the ivories on the famous piano from the movie and gawk at the huge amount of college and professional sports memorabilia. Here's the Kansas City Barbeque's website. This post is part of the brilliant Travis Erwin's idea for Hometown Monday blogging. Incredible, but true! 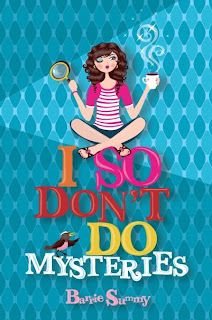 There are a couple of early reviews of I So Don't Do Mysteries. They are from FAMILY MEMBERS who read the Advance Reader Copy. Below are the reviews AND my responses. Aunt Barrie, your book is fantabulous! My response: Would you like to go shopping for jewelery? Your book is really funny, Mom. Which is kind of weird because in real life you don't have much of a sense of humor. My response: Well, I haven't truly had a response. I am in a state of shock. In fact, I am in a state of shock to the point that I have been unable to cook for this child or even take him to swim practice. Okay, peeps. This is totally tongue in cheek. I do feed my children. The last thing I need right now is CPS-Child Protective Services=banging at my door. I have a book deadline. No doubt you've figured this out from the leanness of my posts. I don't have time to chat with well-meaning CPS employees who probably won't get my sense of humor either. Although....would CPS take me away and lock me up? In a place where I'd have beaucoup time on my hands, meals cooked for me and only a very small area to keep tidy? Oh my! I'd probably get the book done early! Yes! Yes! Yes! I'm proud AND REALLY relieved to report that the first draft of the second I So Don't Do book is done, done, done! And my revisions are coming along nicely too. Tonight I celebrate with warm sake and a rainbow roll. Trivia: Did you know that "saki" (not "sake") is a South American monkey with a brown-to-black shaggy coat and a bushy tail. Who, by the way, will not be invited for sake tonight. I think putting up the spud has made me giddy! So, if I'm somewhat MIA, please understand it's because I have to rewrite/polish and get this baby to the editor. Huge congratulations to Child #3 who won FIRST place in FIVE events at this weekend's swim meet!!!!! (The number of exclamation points is no accident.) What about the sixth event, you ask? He was disqualified by an overzealous official. Okay. Fine. The truth: Child #3's turn on the backstroke MIGHT have justified the DQ. And, I was only MOMENTARILY tempted to push Mr. Official into the pool. I'd also like to mention how delightful it is to see Child #3 flying off the block, with that familiar look of determination on his face and know that it's not directed at, say, his little sister. In other big news, we have a new book launch over at the Class of 2k8's blog. Elizabeth Bunce's debut Young Adult novel, A Curse Dark as Gold, is now available in stores. If you have a sec, click on over and congratulate her. In March 1760, a couple of hundred men left Mexico to found the first Spanish church in California. Their leader was a Franciscan Jesuit priest named Father Junipero Serra. This first of 21 missions was built here in San Diego and was called Mission San Diego de Alcala. All the missions were about a day's walk apart along a road called El Camino Real. No way this is the original door because the mission was burnt by natives in 1775 and destroyed by an earthquake in 1803 and another one in 1812. Plus the mission was moved around 1774. Here's an online tour of the San Diego mission. There's something adventurous and potentially life-altering about passing through a door. Literature is loaded with doors and characters who cross thresholds. For a look at some doors around the world, Frank Gardner, the brainchild of these door posts, has links at My Painted Box. 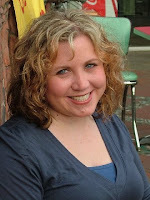 Elizabeth helped organized this blogging event and has links too at The House in Marrakesh. "When fortune knocks upon the door, open it widely." "Shut your door and you will make a prison." Once again, we've dragged out the Official Choosing Boots and the Official Blogging Bowl. I'm over at the Class of 2k8's blog today, posting about who'd make the perfect cast for a movie of I So Don't Do Mysteries. Actually, I let Child #4 doing the casting. She picked a total dark horse for the adult male roles. So, it's a fun post. I think. If you have a sec, click over. I'll check the comments over there too. Hang onto your hats and your loose change! Today's My Town Monday post is about San Diego's 2600-foot-long WOODEN roller coaster called the Giant Dipper. The Giant Dipper is a registered national historic landmark which opened for rides July 4, 1925. It's been updated since then, so that it's, like, safe. Riding the Giant Dipper is one of those things you just have to do if you visit San Diego. It took me a couple of decades, but I finally climbed on last summer because the protagonist in I So Don't Do Mysteries rides it. I will never ride the Big Dipper again. Why? Well, I'm not particularly brave. I suffer bigtime from motion sickness. It's the jerkiest roller coaster I've ever been on. I definitely got bruised up from the ride due to the brutal turns. You know what I don't get? People who buy wristbands and ride the Big Dipper over and over all day long. And eat hot dogs. You know what I really don't get? People who entered the "Whirl Till You Hurl" contests put on by a local radio station. In 1997, three contestants stayed on the Big Dipper for 11 days. They each won a car. In 1998, five contestants stayed on for SEVENTY days and split a $50,000 jackpot. Each day consisted of 22.5 hours on the coaster! Yikes! Hello! $10,000 wouldn't pay for the lifelong chiropractic visits required after such a stunt. And think of the host of unsightly bruises. Also, a marriage could break up during a seventy-day absence from each other. Not to mention, I felt there were important unanswered questions concerning bathroom breaks and sleeping arrangements. Nope. You would never catch me doing a marathon roller coaster ride. I say ride the Big Dipper once. Then meander around the rest of Belmont Park, an amusement center by the beach. Drink some cold lemonade, munch on a halfway decent churro and win some tacky trinkets playing carney games. That finishes up another My Town Monday post. Thank you to Travis Erwin for setting this up. He has an interesting post today about an eccentric in his town of Amarillo, TX. He also has links to others who have written some great off-the-beaten posts! Hi, folks! I'm KELLY Couric. I'm as fun and informed and inquisitive and cute and perky as KATIE Couric. Just slightly less famous. Today with me is LIZ GALLAGHER, the seriously talented author of THE OPPOSITE OF INVISIBLE. If you want the chance to win an ARC (Advanced Reader Copy) of Liz's book, (and who wouldn't? ), comment on today's post. Child #4 will don her famous choosing shoes and pick a name this weekend. Alright then, freebie ARC business out of the way, let's go straight to the fabulous interview a la Kelly Couric. No! I'm a total plunger. I write whatever scene feels most immediate to me at the moment. Then I have a trick: I try to write my way into a scene, then stop. That way, I know where to pick up during my next writing session. That's how I wrote my first novel, anyway. Now I find that I've become a bit more of an outliner, though my outline is very general; it's basically just a list of scenes I've already written and an order they might go in. Not at the moment. I went to Vermont College, where I had amazing workshops and adviser feedback. Since graduating two years ago, I've been on my own, but I love writing communities and keep in touch with lots of friends. I would love to find a group that's right for me in Seattle. When I'm being good! I try to, yes. Sometimes only a few words, and sometimes my writing time is spent doing more thinking than actual writing. Luckily, once I get going, I'm a very fast writer. I'm working on a companion to The Opposite of Invisible. It's set the summer before Opposite and it's about Vanessa, who is my main character's rival in Opposite. It's still set in Seattle, but feels very different because it's in a separate neighborhood and because it's sunny! Vanessa struggles with wanting to grow up too fast and finding a balance between what she wants to do and what she's actual comfortable doing. I'm such a cookie monster! I'd have to say, though, I'm pretty much a classic chocolate chip girl. Warm and gooey, with milk, please. Here's a description of THE OPPOSITE OF INVISIBLE. Yes, I pretty much lifted it from Liz's author page on the Class of 2k8's website. Hey. I'm working like a dog, trying to make a go of this interview gig thing AND manning the drive-through window at In 'n Out Burger. It's not like I'm Katie Couric with a bunch of assistants. THE OPPOSITE OF INVISIBLE: Alice is comfortable staying in the background at school, working on projects in the art room, or happily cocooned with her best friend, Jewel, a very cool boy she's known forever. She can talk to Jewel about almost anything. But she can't tell him about her secret crush. Or that she's ready to stop being so invisible, to take some chances with art, friends, even romance. Love and friendship have big surprises in store for Alice in this irresistible debut novel set against the lively, quirky, backdrop of Seattle. And here's Liz Gallagher's website and Liz's blog. Thank you for the interview, Lizzie. You've been a great sport. After reading THE OPPOSITE OF INVISIBLE, I can say from the bottom of my Kelly Couric heart that this book is excellent! So, leave a comment here for a chance to win the ARC of THE OPPOSITE OF INVISIBLE. Okay. So, it's going to be your basic hodge-podge post. I LOVE collective nouns. And hyphens. And I rarely turn down a glass of a halfway decent pinot noir. The fake Katie Couric returns tomorrow for an interview with the talented Liz Gallagher, author of THE OPPOSITE OF INVISIBLE. The fake Katie Couric (try saying that five times fast!) is full of quips and humor and good interview questions. Not to say the real Katie Couric isn't all this and maybe more. Just don't sell the fake KC short. PLUS, the fake KC is GENEROUS. 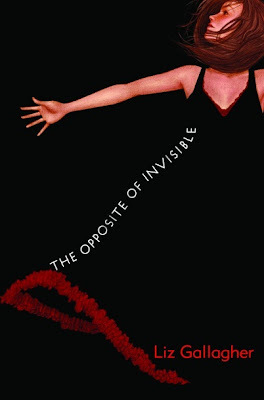 She has an ARC (Advanced Reader Copy) of THE OPPOSITE OF INVISIBLE to give away to a lucky commenter. And I don't believe I ever heard of the real KC doling out prizes. So: Tomorrow. Here. Author Interview. Liz Gallagher. Free ARC. TODAY, you could click over to the Class of 2k8's Blog where it's Jody Feldman's launch week for her middle grade novel, THE GOLLYWHOPPER GAMES. AND there's a great book trailer too! 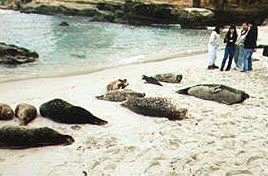 The Children's Pool AKA Seals' Beach is located in La Jolla, northwest of downtown San Diego. This is a corner of San Diego where a seawall was built in 1930 to provide a sheltered beach for children. 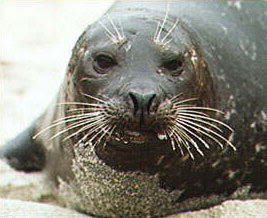 In the mid-nineties, Harbor seals discovered the beach. And loved it. They had a little sealie meeting and, after some barking and raising of flippers, decided to make it home. Talk about your perfect location for hanging out, napping, birthing pups, nursing pups and just generally lazing around in the delightful San Diego weather. However, besides just chilling at the Children's Pool (which the seals renamed Seals' Beach), the seals, uh, pooped. A bunch. The water in this area is full, full, full of bacteria. As you can imagine, there are loads of people who are fighting for the seals' rights and loads of people who are fighting to have the area returned to humans. There are probably even some people fighting for the rights of the seaweed too. This is, after all, California. It's currently birthing season (Jan. - May) and you can get some great shots of seal pups. You can get some great shots of adult seals too. Actually, it's quite amazing how close to the seals you can walk. The City of San Diego is trying to find the funds to dredge the Children's Pool/Seals' Beach. This would both lower the amount of bacteria and drive away the seals. So, if you're interested in wandering around what is basically a Harbor seal rookery, head over to San Diego sooner rather than later. I'm closing with some seal trivia. What do you call a group of seals? Feel free to make up your own expression. Travis Erwin , who came up with this brilliant Hometown Monday idea, has links to posts of all kinds of interesting places. Child #4 has let loose of the Santa Claus issue. And, I being a wimpy mother, am not pursuing the unmasking of the jolly old elf. Instead, she is concentrating her seven-year-old energies on the delivery and collection of monies for Girl Scout cookies. She has sold more Thin Mints than any other cookie. If she draws a bar graph of her sales, I'll post it for your bloggy pleasure. She is also thrilled to be attending a baby shower later on today. The shower is for a baby boy who arrived a couple of weeks ago from Korea. Also Chlld #4's birthplace. Who knows what words of wisdom she will pass onto the eight month old. I do know she is looking forward to eating cake. Tomorrow, I will be participating in Travis Erwin's My Town Monday. I've written an interesting post on Harbor Seals and San Diego. I'm anticipating a call from the City of San Diego. No doubt they're planning to name a street or a bridge or a fish taco after me for singlehandedly increasing tourism in our town. Tomorrow's post will be, after all, my second about San Diego.